Six times a year, Writers@WRUV takes a field trip to the University of Vermont’s Fleming Museum to record some of the best live performances of poetry and spoken word to be found in Vermont. These performances are part of the “Painted Word” poetry series, hosted by UVM’s own Major Jackson, a noted poet and poetry editor of the Harvard Review. Writers@WRUV takes pleasure in bringing these poets to the airwaves. Many of the most recent shows can be found here. For information on future readings, please visit the Fleming Museum site. November 2010: Our show features celebrated poet and Burlington native Dan Chiasson, who reads alongside Massachusetts poet Lea Banks. 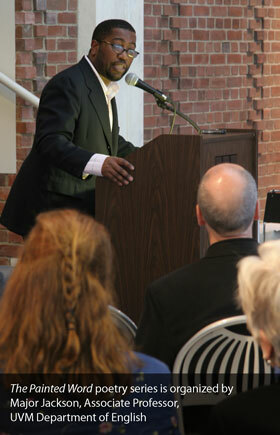 The show was taped November 17 as part of the Painted Word Poetry Series at UVM’s Fleming Museum. 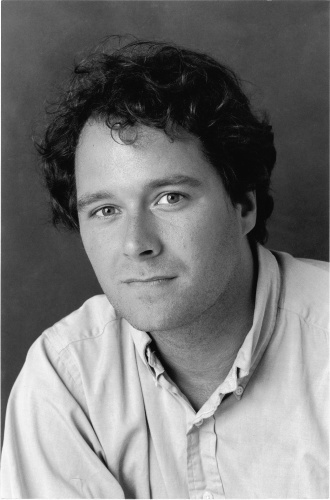 DAN CHIASSON was educated at Amherst College and Harvard University, where he completed a Ph.D. in English. He is the author of three collections of poetry: The Afterlife of Objects; Natural History; and Where’s the Moon, There’s the Moon, recently published by Knopf this Fall. 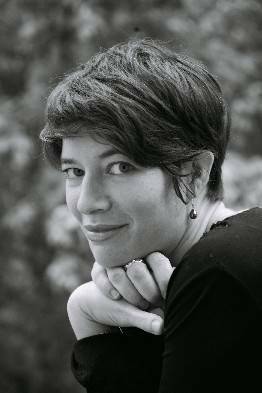 Former poetry editor of The Paris Review, Chiasson serves as a poetry critic for The New Yorker and The New York Times Book Review. He is the author of a critical study, One Kind of Everything:Poem and Person in Contemporary America. The recipient of a Pushcart Prize and a Whiting Writers’ Award, he is a Professor of English at Wellesley College. He lives in Sherborn, Massachusetts. 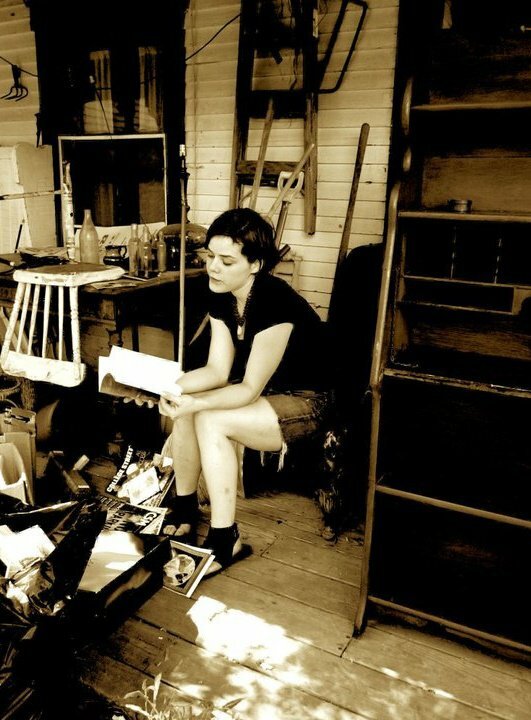 LEA BANKS is the author of the chapbook All of Me, (Booksmyth Press, 2008). She was a finalist for The Pavel Srut Fellowship in Prague and two poems were 2009 Pushcart Prize nominations. Banks is the founder of the nationally-known Collected Poets Series in Shelburne Falls, MA and editor of Oscillation: Poetry in Motion. She was the former poetry editor of The Equinox and editorial assistant for the Marlboro Review. She attended New England College’s MFA program, facilitated stroke survivors’ writing workshops, and is a full-time poet, community organizer, freelance editor and writer. Banks has published in several journals including Poetry Northwest, Slipstream, Diner, Sweet, and American Poetry Journal. See more at www.leabanks.com. October 2010: Today’s podcast features the work of Thomas Heise and Bianca Stone, who read earlier this month at the Fleming Museum as part of the Painted Word Poetry Series at the University of Vermont. Though we don’t give listening tips very often, here’s one for today: Bianca’s work is a multimedia event—at left, notice a screenshot of one poetry comic—so please click here for Bianca’s Poetry Comics to get the visual portion that radio simply can’t bring you. BIANCA STONE received her MFA from NYU’s creative writing program in poetry in 2009. She is the creator and co-curator of the Ladder Poetry Reading Series in New York City and is a regular contributor to TheThe Poetry Blog. Her most recent poetry publications include The Patterson Literary Review, Fou, Agriculture Reader, and Conduit. She was also a recent finalist for the 2010 Crazyhorse prize in poetry. Her new chapbook of poetry is called Someone Else’s Wedding Vows (Argos Books, Fall 2010). Besides writing, Bianca is also a freelance illustrator, often combining poetry and illustration. She is currently working on a manuscript exploring the mixed genre of poetry and image. 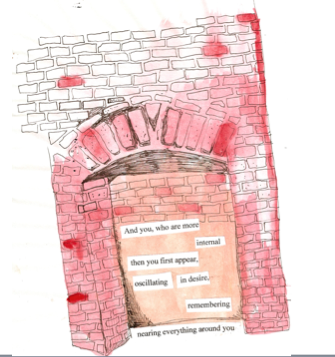 Her blog is called Poetry Comics. She hails from Middlebury, Vermont: daughter of writer Abigail Stone, and grand-daughter of poet Ruth Stone. She lives in Brooklyn, NY. 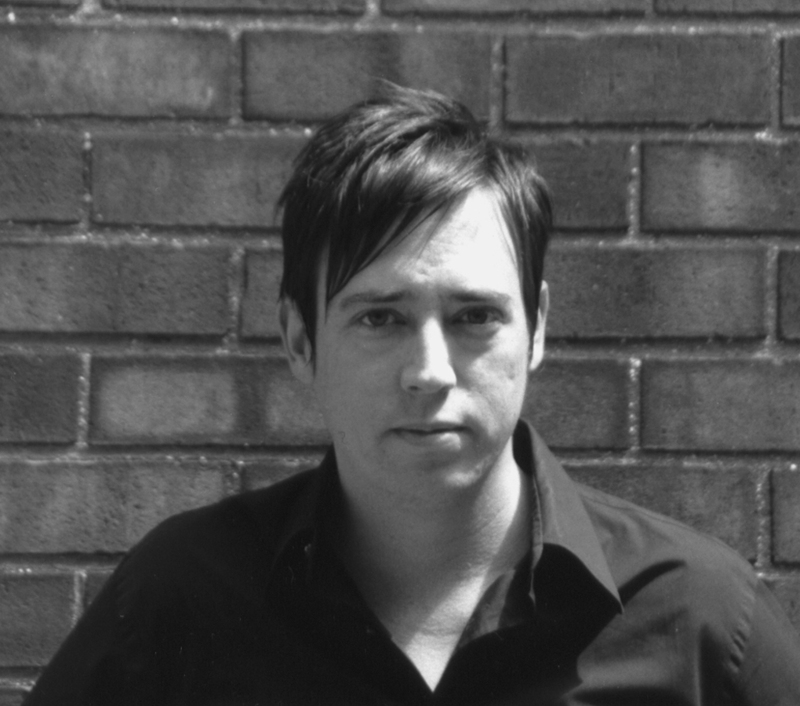 THOMAS HEISE is an assistant professor of English at McGill University and the author of Horror Vacui: Poems as well as the critical study, Urban Underworlds: A Geography of Twentieth-Century American Literature and Culture. His poetry and essays have appeared in Legitimate Dangers: American Poets of the New Century, Gulf Coast, Ploughshares, Modern Fiction Studies, and in the BioCritique series. He has been the recipient of awards and fellowships from the University of California, New York University, the Millay Colony for the Arts, and Middlebury College’s Bread Loaf Writers’ Conference. September 2010: Major Jackson frequently selects poets from New England and occasionally from beyond. For the opening session of the 2010 series, he invited Taije Silverman from Philadelphia and Aracelis Girmay from Brooklyn. Taije Silverman’s debut book of poems, Houses Are Fields, was published in 2009. Her poems have appeared in Poetry, Shenandoah, Ploughshares, Five Points, Massachusetts Review, and other journals. The recipient of the 2005–2007 Emory University Creative Writing Fellowship, the 2010-11 W.K. Rose Fellowship from Vassar College, and residencies from the MacDowell Colony and the Virginia Center for the Creative Arts, she lives and teaches in Philadelphia. In 2010-11, she will be working and teaching at the University of Bologna on a Fulbright fellowship. The inheritor of Eritrean, Puerto Rican, and African-American traditions, Aracelis Girmay writes poetry, essays, and fiction. She is the author of Teeth, a collection of poems published by Curbstone Press in 2007, which won the Great Lakes Colleges Association New Writers Award and was nominated for a Connecticut Book Award. Her collage-based picture book, Changing, Changing: Story and Collages, was published by George Braziller in 2005. A recipient of fellowships from the Watson and Jerome Foundations, Girmay is a Cave Canem Fellow and serves on the board of the Acentos Foundation. Originally from southern California, Girmay lives in Brooklyn and teaches community writing workshops there and in the Bronx. She also teaches in Drew University’s low residency MFA Program and at Queens College. 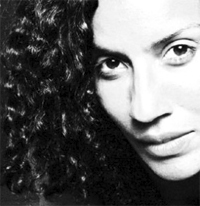 In September 2010, Aracelis Girmay assumed her duties as a full-time professor of poetry writing at Hampshire College.